Creative activities for children to grow, learn, and stay healthy from head to toe. These two words don’t typically go together in the traditional sense. Boo! Trick or Treat! We'll be hearing those lines on Halloween, as little witches, superheroes, and vampires knock on our doors for treats. Treats are a part of the tradition; however, treats don’t have to be only candy. When gathering the treats you will offer this year think about some other options. We have gathered some ideas for you. Treats that do the Trick - Surprise your trick-or-treaters with some of these fun and healthy treats. Healthy Halloween Snacks - Creepy but nutritious, presented with a little extra twist to make it more appealing to kids. Plan a Halloween Party for your Kids - It’s a great alternative for children going out trick-or-treating. We collected some great ideas for you. Tricks for Treating - Treats are a part of the tradition, but for many parents the most frightening thing about Halloween is how to deal with the avalanche of candy that comes into the home on Halloween. 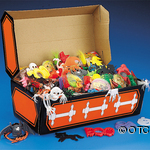 Halloween Activities & Crafts - Halloween craft ideas, activities and coloring pages and much more. Other Halloween Resources - Halloween Decorations, music and book suggestions. Small toys make unexpected treats that last longer than the sweets. Your children will love this apple for snacks or dessert!.